In home senior care is a crucial component in a blend of services that reduces hospital re-admissions. That was the clear outcome of a recent study by Brigham and Women’s Hospital in Boston. The study used data from over 9,000 medicare patients and found eight high risk indicators for hospital re-admissions including length of stay, age, hemoglobin levels, and arguably the most controllable factor… lack of essential in-home follow up care. Sometimes a hospital stay followed by rehab can provide an opportunity to introduce a change in overall independence to your elderly parent or grandparent. 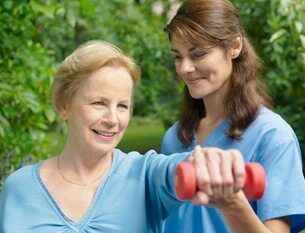 The relative you care for may have been refusing to accept certain inevitable declines in their independence, while you see the need for a caregiver or home health aide. Discharge from rehab may provide the perfect occasion to convince them to accept a home caregiver service as a temporary solution that could become permanent if it works out. In addition to needing help with mobility, daily stays by a home health caregiver can avert hospital re-admissions. Seniors released to home from acute care or rehab often have a change in their regular medication routine, need frequent blood pressure checks, feel weak and unable to prepare healthy meals and wash the dishes afterwards. In cases of dementia (or even fear of going back to the hospital) a patient may not report dangerous symptoms to anyone, but having an elder care worker in the home to notice signs of complications such as dizziness or coughing up blood, will prompt a call to the nurse. A new study by the Dartmouth Institute for Health Policy and Clinical Practice interviewed readmitted patients and their doctors. The health professionals insisted that many of their elderly patients were so anxious to leave the hospital that they falsely claimed to understand discharge instructions and be ready to handle their own discharge. Providing the right amount of in home senior care after discharge goes a long way in avoiding unnecessary urgent hospital care and re-admissions. In the end in home senior care will help prevent a senior from an unnecessary trip back into a hospital or rehab facility, and will allow them to live independently in their own home while having someone present in case of an emergency. Minute Women Inc., is a private duty home care company located in Lexington, MA and provides in quality in home senior care to cities and towns in metro-west Boston.